The Druid Hills Patrol catchment area overlaps with two police jurisdictions, City of Atlanta and DeKalb County. A small part of it falls into the Atlanta Police Department's Zone 6, Beat 608. There are 12 beats in the Zone 6 precinct. The larger area falls into the DeKalb Police Department's North Central precinct, Territory 220. There are 8 territories in the North Central precinct. Both police departments are understaffed. Consider that for both departments, only one officer is assigned to both patrol the entire beat/territory and respond to 911 calls such as car accidents, burglaries, robberies, assaults, domestic violence, etc. Of course, DKPD and APD prioritize calls to ensure that serious emergencies such as home intrusions, armed robberies, assaults, vehicle accidents with injuries and the like always receive the most rapid response. Extra backup officers are available within each larger precinct. However, if the assigned beat/territory officer is already responding to a call when another comes in, a backup officer would have to be pulled from another beat/territory. S/he may have to leave another (lower priority) call or travel across the multi-beat precinct or even travel from another precinct, and that can cause delays in response time. For many reasons it is increasingly difficult to staff police departments. That is why police department leaders emphasize that our common safety requires a comprehensive approach that includes the Atlanta and DeKalb County Police Departments, the Druid Hills Patrol, neighborhood watches, and increased physical security of our homes (locks, security systems, lighting, fences, and cameras). Clearly, these circumstances mean that we cannot expect our understaffed police departments to rapidly respond to a call about a suspicious person wandering the neighborhood, a strange vehicle parked in front of our house, etc. 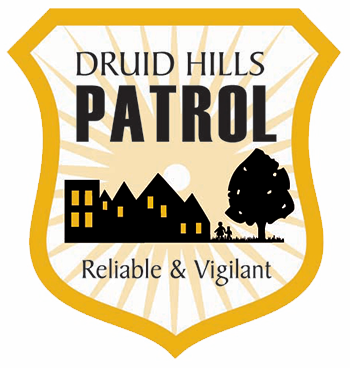 However, we CAN expect an immediate response from the Druid Hills Patrol during the hours they provide the much-needed patrolling. The DHP officers’ ONLY assignment is to deter crime in the coverage area and monitor police radio for emergencies in Druid Hills. When they are already patrolling the neighborhood, they usually respond faster than DKPD or APD officers. A not insignificant side benefit is that they can cancel false alarms, preventing residents from paying fees and police departments from wasting staff time.